Carl Otto Czeschka (1878 Vienna--1960 Hamburg) studied at Vienna’s Akademie der bildenden Künste (Academy of Fine Art), was a member of the Secession, and taught at the Kunstgewerbeschule (School of Arts and Crafts), where Oskar Kokoschka was one of his students. Czeschka was a central figure in the later development of the Wiener Werkstätte (Vienna Workshop), the art and design manufacturing and sales collective founded in 1903 by Josef Hoffmann and Koloman Moser, that pursued the ideal of the Gesamtkunstwerk (total artwork), a unification of artists and craftsmen of different disciplines in the creation of an overarching lifestyle concept. Czeschka’s association with the Wiener Werkstätte began in 1905, and he became one of its leading artists. In addition to his outstanding work in graphic design, he created designs for furniture, metalwork, textiles and jewelry. He participated in significant Werkstätte commissions, such as the Palais Stoclet in Brussels (1905-1911) and Vienna’s Cabaret Fledermaus (1907). 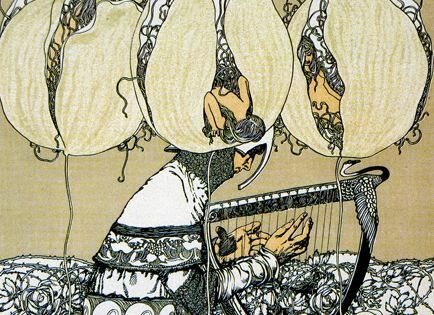 His most important book illustrations were those for Franz Keim’s Die Nibelungen (1909). Czeschka’s designs, often including a vine motif, mark a stylistic shift at the Werkstätte, from the geometry associated with Hoffmann and Moser in its early years to a more decorative, figural sensibility. Over the course of his career, Czeschka continued to do notable work, including theatrical designs for the Austrian director Max Reinhardt and the design of the masthead for the German weekly Die Zeit (Time), which is still in use today.